Your surgeon will have spoken to you at length about your surgery and all that relates to the surgery with regards to medical and surgical complications – a consent form will be completed with your surgeon before your planned surgery. An information leaflet with diagrams explaining your surgical procedure and the condition that results in the need for your surgery will be provided to you by your surgeon before your procedure. Each surgery is different depending upon the individual and their particular problem and needs. However, a standard number of events pre and post-surgery usually take place. 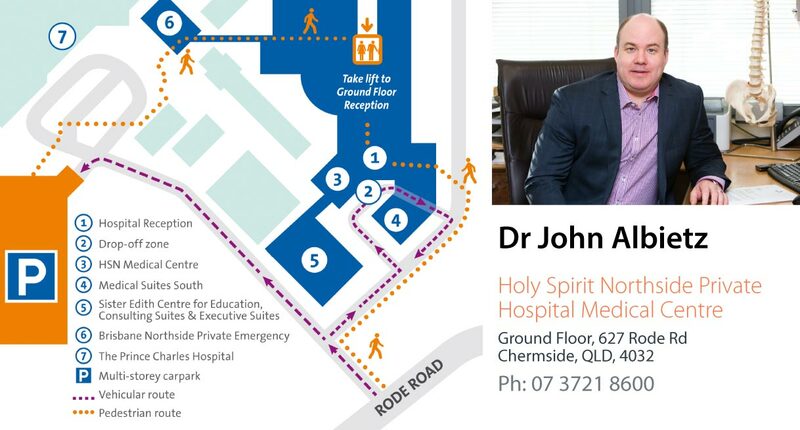 A visit to the hospitals pre-admission clinic is usually recommended for all patients, however a telephone consultation is available for patients who live outside of the Brisbane area. The pre-admission clinic provides a service that checks past and present medical conditions that may have an effect upon your surgery or anaesthetic. It can also help and plan for those patients who need special social or travel arrangements pre and post-surgery. Routine blood tests, cardiac tests and any other medical tests required will be arranged through this service and results are provided to your anaesthetist and surgeon prior to your surgery. It will be recommended that you cease all blood thinning medications at least 10 days before your surgery. These medications include Aspirin, Warfarin, Plavix, Iscover, Methotrexate and/or any anti-inflammatories such as Celebrex and Mobic. Failing to mention this may delay your planned surgery so if in doubt, please ask your surgeon or the pre-admission staff. Consultation with your cardiologist or other doctors may also be required. Alternate and complementary therapies should also be disclosed prior to surgery. It is recommended that you cease smoking at least 8 weeks before surgery if possible, we do understand that this is often difficult. Please advise your anaesthetist if you have a cold or chest infection within 48 hours of your planned surgical procedure. Please advise our rooms if you have any scratches, cuts or skin irritations surrounding the site where surgery will be performed. Surgery cannot proceed with lesions surrounding the area if these have any signs of infection. You need to cease eating and drinking at least 6 hours before your scheduled surgery time. Our rooms will contact you the day before your procedure to confirm your admission and fasting details. You should notify your surgeon’s staff and/or the pre-admission staff of any medical conditions that may affect your surgery if you have not done so already at consultations with your surgeon. These conditions may include diabetes, high blood pressure, cardiac problems, previous history of strokes or blood clots or any adverse anaesthetic result in the past. If a medical certificate or carer’s certificate is required, please contact our rooms. Please bring along any films that you have relating to this surgery such as x-rays, MRI or CT scans. Any x-rays or scans left in our consulting rooms will be forwarded onto the hospital prior to your surgery. Please ensure you have paid any necessary out of pocket expenses prior to the day of your surgery. Lastly, you should try to come rested and relaxed on the day of your surgery.